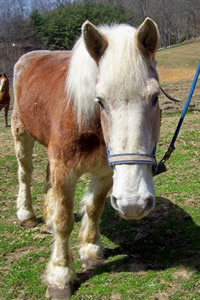 Severely underweight, this wonderful Belgian has a bigger problem – her feet. When you weigh THIS much, and you spend up to 18 hours a day on your feet, you’re hurting. Her back feet are in serious need of special farrier work, including x rays, rebuilding and casting a hoof wall blown out by abscesses two years in a row. 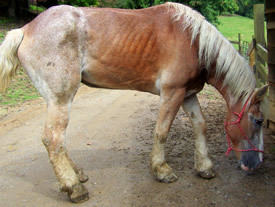 She also has scratches and thrush from standing in mud for too many years, and all four feet are splayed and split. Even with all the recent rains, she is now on dryer ground at S.T.A.R. and has a sawdust stall for comfort. Doing everything possible to save her feet, so S.T.A.R. can save her life, is going to be expensive. She is amazingly gentle, stoic and friendly. Loves apples! Lucy on a sunny March day. She is standing with her feet under her shoulders now, and weight equally distributed. NO PAIN!! Her back legs are no longer bowed. She still has the cast and shoe on her back right hoof. Four visits from the farrier have worked wonders. Much more to go, but great progress so far. Her big, beautiful eyes are bright and happy. Please note her back line. The hump is gone from keeping her feet tucked under her. Her ribs are almost filled in. She “eats like a horse”!! Resting comfortably, knowing she can get up now. What an amazing girl. Thanks to everyone who played a part in saving Lucy, to all her financial donors, to American Humane for their 2nd Chance Fund, to her faithful volunteers and those who prayed. Donations to help pay for Lucy’s bills at UT would be appreciated.